Cozy Chicks: DO YOU FEED WOODLAND CREATURES? DO YOU FEED WOODLAND CREATURES? The cashier at Lowe's clearly thought I was crazy. "How do you cook these?" She asked. "They're hard as a rock. And they don't look very tasty." She was eyeing the 20 pound bag of dried corn cobs I'd just bought. "I don't cook them," I told her. "I put them out in the backyard for the squirrels to eat. They love them." "You feed the squirrels?" she asked in amazement. She literally took a step backwards, as if such insanity might be catching. "Yes, of course, and the raccoons, and the possums and well, anyone else who wants to stop by." The truth is, I try to make my yard a wildlife refuge, especially in the cold winter months here in the northeast, where woodland creatures have a hard time finding food. I realize a lot of people don't agree with my project, especially when deer from the neighboring state park invade us during the summer. Do they eat my shrubs and flowering plants? Yes, sometimes. Do I care? Heck no! The animals were here way before the developers so I figure they're more entitled to the land than I am. My name may be on the deed, but they've been here for hundreds of years. 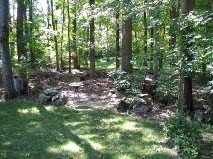 I'm fortunate that our lot is very "woodsy," and we've let the backyard go "natural." The soil is clay, not dirt and there are so many drainage problems, it's almost impossible to grow anything. So I decided to turn a negative into a positive. I turned my backyard into a wildlife haven! 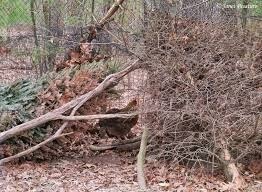 I also save Christmas trees, potted plants and tree branches to make "shelters" for the outdoor animals. You'd be surprised how rabbits and squirrels love to burrow inside and make a warm den for their babies. If you'd like to do the same with your backyard, here are a few tips to get you started. *Don't follow the typical gardener's advice to "cut back, cut back!" in the Fall. Let it go, you can clean it up in the Spring. In the Fall garden, there are plenty of tall stalks topped with seeds, and trees drop nuts and fruits on the ground. The birds will thank you! 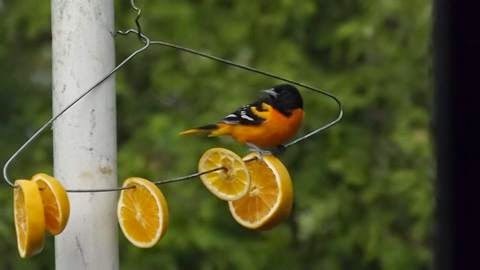 You can make a cool bird feeder with a coat hanger and some fruit slices. And keep the bird bath filled with water, preferably warm water it so it will freeze less quickly. *Migrating birds flying along the Atlantic coast rely on fruits and seeds to sustain them on their way. Native birds need the same nutrients to help them survive the bitter winter. Asters and goldenrod make great food sources for songbirds, so please leave them until the Spring. 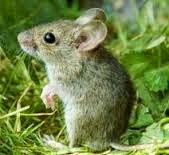 *Dying plants provide shelter for small mammals, so please leave them. To you, they may look "messy," but to a small woodland creature, it's home. Mammals and small birds use these withering plants as a place to hide and keep warm. Insects use them for hibernation. 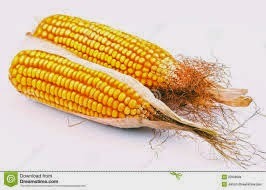 *Plants with hollow stalks can shelter native bees and other insects. *Instead of bundling and disposing of branches and debris, try stacking them out of sight in the garden. Piles of brush give small animals place to hide from predators and a cache to store their food. Squirrels will hide their seeds and nuts in brush piles so they can find them later, when the yard is covered in deep snow. Try these simple tips and more animals will make it through the winter. After all, you like having a cozy home and they do too! Love it. When I lived back east, I fed the deer, raccoons, skunks, squirrels, possums,chipmunks, birds, and red and gray foxes. I miss that. I used to lean out of the dining room window and hand marshmallows to the raccoons. The best was when the animals would bring their babies for a visit. I had one doe who would bring her twins and make them lay down in the backyard as she went and had some me time.. 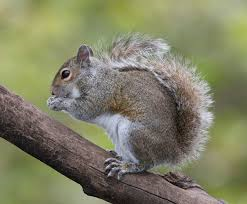 So far, living in California, the only wildlife I've seen, other than birds, have been squirrels. We moved from a house on half an acre to a condo on the second floor. What I wouldn't give to be able to move back to my little house. Hi Char, that is amazing!! Love the idea of the marshmallows and the raccoons! And the doe with her babies. It really is fascinating to watch the animals come to play and congregate--my cats find it endlessly fascinating. Thanks so much for stopping by. I feed the squirrels, but the red-tail hawk fed on one squirrel yesterday. Hey, they have to eat also! What a heartwarming post, Mary! We also leave our yard 'natural' until the spring. We love the squirrels, although the dachshunds are bedeviled by them. Lots of bird feeders and all that too. The year we lived in England I had a friend who used to make peanut butter and jam sandwiches for the foxes. I thought you should know! Thanks, Mary! I agree...feed them all. My mother used to have birds and fed outside birds, too. She called them "her birds and God's birds". We grew up always having cats, dogs and nature around us. Mary, I'm all for feeding wildlife--in fact we spend a small fortune on thistle and sunflower seed, as well as corn. But it's simply not true that the deer were here before we were. Yes, there were deer, but the number of deer in the US has exploded over the last thirty years, as more and more land is developed. It seems counter-intuitive, until you realize that deer cannot possibly thrive in forests. Leaves that are over six feet high are completely inaccessible to them. 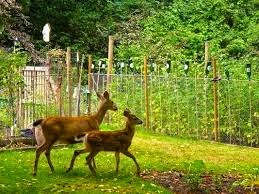 Their preferred food is on the edges of forests, not in the middle, and with all our backyards we have actually given them more habitat, rather than less. They prefer to have smaller open spaces, with cover they can run to when threatened. The average suburban yard gives them exactly that situation. We live in a suburb teeming with deer, and they barely pay any attention to us. But at our farm in rural Kentucky the deer--who can see a long way, with no cover in between--are very wary there, and we can't get within 50 yards of them. That is their actual, preferred habitat, and where they always were, until we made better places for them to thrive. You are a Very Nice Person Mary! As you know Mary, I feed stray cats and I also feed raccoons, opossum, squrriels and birds. My cats love to watch the animals through the storm door and since they're inside cats only, there's no danger to them. In our very suburban location, we also have a large number of squirrels, a few groundhogs and raccoons and my favourite, rabbits. I love to watch and photograph them. The cardinals are especially fond of our bushes with berries and the bunnies often feast on the bark of our Burning Bush (doesn't harm it - always bounces back in spring). My cats stay inside, but the feral cats outside can be a bit hard on the wildlife. They will occasionally bring me a dead bird or "parts" of a squirrel. They insist on dropping them on my back step. I know that hunting is a natural part of nature, but I don't want to SEE it. I used to have a lot of bird feeders but I had to remove the lower ones because they were too easy for the cats to reach. Now I have feeders on 6' poles, and I also put seed, corn, peanut butter and fruit along the top of the fence for the birds and squirrels. I also have thistle "socks" and a hummingbird feeder. I don't get a lot of other critters, but I've had a skunk, raccoon, and a bunny. I wish I lived where I could watch the wildlife. I love to feed the critters. I have a flock of Blue Jays who yell at me when their peanuts run out. As soon as I fil up the peanuts they swoop down and grab them. Squirels, Chipmunks and Cardinals get peanuts, too. And, all the other birds get seeds. My Yellow Finches and Chickades love Nyjer Seeds. I try to slow down feeding in the summer so they take my bugs! I have indoor only cats and one of the peanut feeders is right by a window where they have a seat. As soon as they hear the loud Blue Jay call they run. Of course they would not have the slightest idea what to do with a bird, they can't even catch a fly when in comes in. But they like to pretend they are the big hunters. MJ, the person who made pb and jam sandwiches for the fox is a woman after my own heart!! I make endless saltines topped with peanut butter--my neighbors think I'm nuts but that's okay! Bears and coyotes do sound intimidating! I should start doing more photographs, good idea! Hi becky, I know you do, we are truly kindred spirits! We do feed deer, turkeys, and it goes without saying the squirrels and bluejays and morning doves get their fill! and try to cut back in the summer. Good idea on piling brush, though we have woods all around so they have no problems hiding their food stash. Our indoor cats love to watch them especially the chipmunks who tease them! HI Anne, that's interesting about the turkeys. We had some wild turkeys in the state park nearby but I think the foxes got them--I haven't seen them in ages. Thanks for stopping by!